Clubroot has been identified in canola southeast of Peace River in northern Alberta. Although clubroot has been found in various counties in Alberta since 2003, this is the first year the disease has been confirmed in Northern Sunrise County. 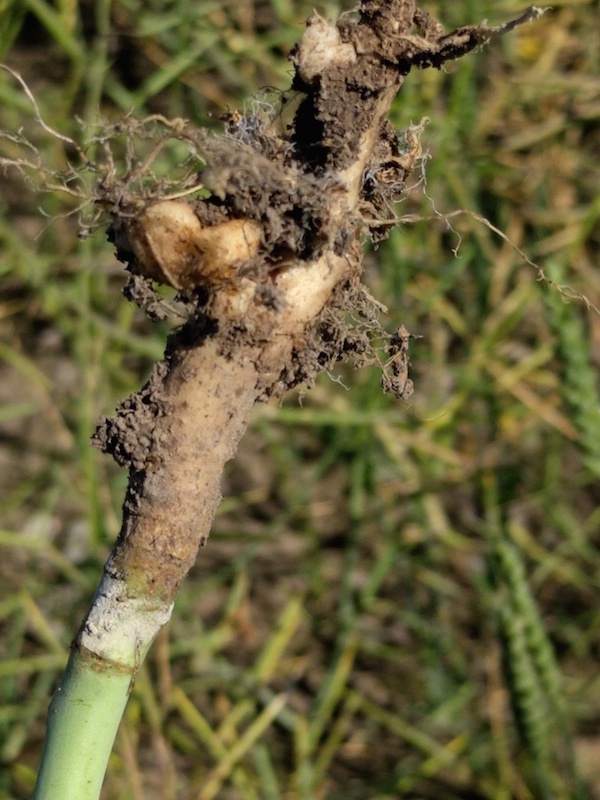 This fall, Peace Country canola growers should be especially diligent in scouting their canola fields for clubroot and should consider deploying resistant cultivars in future canola production cycles. Under high disease pressure, above-ground symptoms of clubroot can include stunted growth, wilting and premature ripening. These symptoms should not be mistaken for drowned out areas, which have been common across the Peace. Start looking for the disease around field entrances and in areas with higher moisture or where soil movement may have occurred in a field’s history. Proper diagnosis should always include digging up plants to check for gall formation on roots. This time of year, many galls will likely have matured and decomposed into a peat-moss-like (or sawdust-like) substance around roots. If growers or agronomists find galls, a substance that looks like it might have been galls, or any suspicious looking roots, samples can be sent to a lab for proper diagnosis. Find the labs list at clubroot.ca. Working together, producers, industry, municipalities, Agricultural Services Boards and producer groups can help minimize the spread and severity of clubroot. Research and Development efforts to develop more mechanisms and tools to fight clubroot remain a very high priority; we are all fighting clubroot, together. Alberta Canola will be hosting twelve Powering Your Profits meetings in Alberta this fall, including events in Grimshaw, Nampa and Grande Prairie where there will be a focus on clubroot identification, prevention and management strategies in Northern Alberta. More information on Powering Your Profits tour dates at albertacanola.com/PYP. For further information contact Gregory Sekulic, Canola Council of Canada agronomy specialist for the Peace Region, at Sekulicg@canolacouncil.org or 780-832-2382. 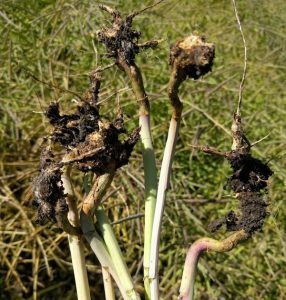 Clubroot galls found in canola in northern Alberta.